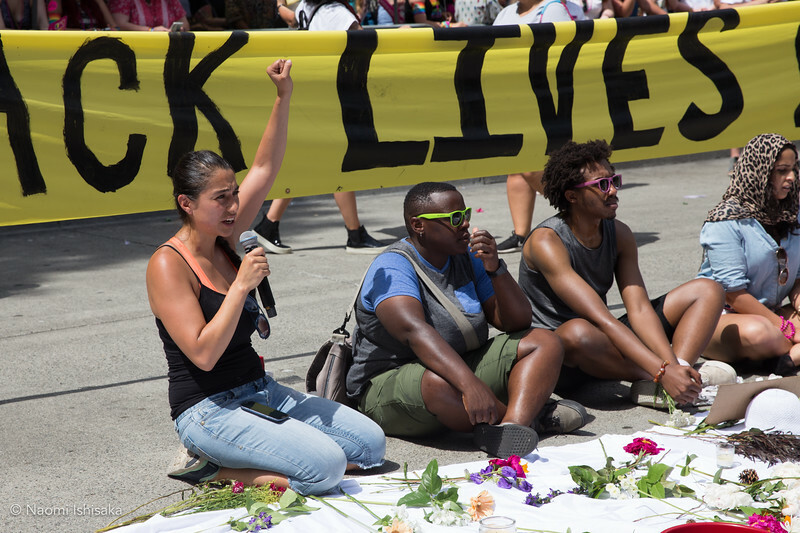 During the 2017 Seattle Pride parade, participants in the #NoJusticeNoPride protest blocked 4th avenue and built an altar to honor QTPOC ancestors. The protesters held the street for 30 minutes in honor of the 30 years of Charleena Lyles' life. Their statement follows. "No Justice No Pride Seattle #NoJusticeNoPride #SeattlePride #Pride2017 As Two Spirit, queer and trans people... * We are not proud of Wells Fargo, Chase Bank, and Bank of America’s participation in Indigenous genocide and investment in projects that pillage the land and contribute to climate change. * We are not proud of governments like King County that choose caging our disproportionately Black and Brown youth over investing in their futures. * We are not proud of medical establishments like UW Medicine and Kaiser Permanente that make it optional for providers to be Two Spirit, queer and trans competent. * We are not proud of corporations like Boeing that assemble war machines that lead to the deaths of Black, Brown, Two Spirit, queer and trans people all over the world. * We are not proud of corporations like Microsoft and Amazon that are in large part responsible for gentrifying this city and displacing Black, Brown, queer, trans, and disabled people. * We are not proud of the Seattle Police Department, which enacts police terrorism on communities of color, which makes many in our community afraid for our lives. � We are against corporations marching for human rights who are directly participating in assaults on human rights. We do not buy into Seattle Pride’s vision of LGBTQ diversity and inclusion, which gives a pass to companies and governments to make money off of poisoning people, locking people up, and paying people unlivable wages. At the same time, we are in solidarity with workers at these companies and look forward to working together to build toward a world where we are all free."